'Tokoliana', the lead track is a political message from a revolted heart that describes how the daily struggle of Kinshasa forces its own on each other. Translated, Tokoliana means "We are devouring each other".... a clear reference to the daily struggle and corporate greed that has engulfed the country. Wrapped in trademark Debruit production and rhythm, this aggressive message is given a warm, punk funk feel reflecting the optimism of the people. 'L.O.V.E.' is a track that features Rachel Nyangombe on vocals.... strange mechanical sounds emanate from the instruments...a kick is a thumb against a cable, and the snare/clap being small tomato cans hitting concrete, a two strings guitar made of a flattened powdered milk can provide the strum. L.O.V.E. is a testament to the Diy craftsmanship of these musicians. 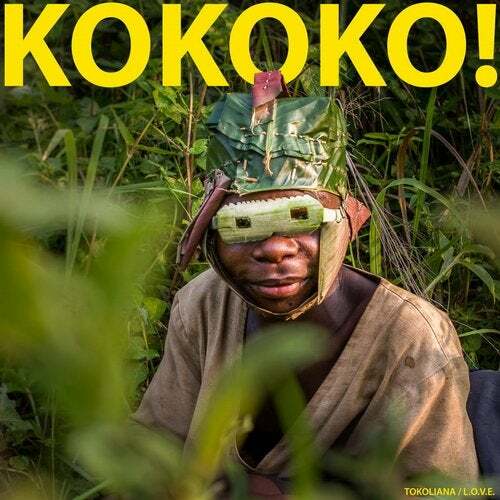 La Belle Kinoise who have been shooting films in the DRC for 14 years joined forces with prolific French producer Debruit, working with local musicians, instrument inventors and the artistic groups of Kinshasa, together they formed KOKOKO! A wind of change is blowing over the cultural landscape of Kinshasa. An amazing alternative scene is thriving that can't just be defined or looked at with a western eye as "african music" and even less "world music"... it is explosive and vibrant. These sounds are emanating from the ghetto and downtown clubs in between the Governments imposed power cuts. The artists actually bring something alive, strong new ideas with DIY constructed instruments with a powerful and unique drive. This movement is more expressive, lively and direct compared to most big cities' scenes, like NYC, London, Berlin... It's raw and free like NYC in the 70's and 80's or Berlin in the 90's, it's inventing everything from nothing and it's happening now. Daniele Baldelli & Marco Dionigi - Eternity E.P.